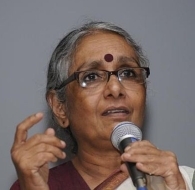 Social activist Aruna Roy has decided not to continue in the United Progressive Alliance chairperson Sonia Gandhi-led National Advisory Council after her term expires on Friday. Roy has written to Gandhi requesting that she should not be considered for another term of NAC and the UPA chairperson has accepted the request. "I am grateful for your accepting my request, while assuring your continued support to campaigns for social sector causes being taken up outside the NAC," Roy has said in a letter to Gandhi. Roy's NAC term comes to an end on May 31. She has also criticised the Prime Minister's Office for not taking up the recommendations of the NAC on minimum wages to workers under the Mahatma Gandhi National Rural Employment Guarantee Act. "I do believe that it is extremely unfortunate that the prime minister rejected the NAC recommendations on payment of minimum wages to MGNREGA workers and chose instead to appeal the Karnataka high court judgment ordering payment of minimum wages to MGNREGA workers," she said. "Even more distressing is the government's refusal to pay minimum wages even after the Supreme Court refused to stay the Karnataka high court judgment. It is difficult to understand how a country like India can deny the payment of minimum wages and still makes claims of inclusive growth. However, I realise that this effort to persuade the government to respect the minimum wages law must now continue outside the NAC," she said. Highlighting the role of NAC, she said the NAC working group on implementation of flagship programmes took up several issues related to implementation of the MGNREGA. "The recommendations of the working group were sent to the ministry, which has set up a programme advisory group to oversee implementation of these recommendations and the new guidelines that have been issued by the rural development ministry. Despite its contribution to changing the lives of the rural poor, implementation of this crucial flagship programme remains a challenge," she said. On the Food Security Bill, Roy said, "The recent record of Parliament on debating policy and legislation underscores the need for this process. Given the hunger and malnutrition scenario in the country, a Food Security Bill should have been debated and passed by Parliament by now. There has been extensive and healthy debate within the NAC as well as in the public domain on the provisions of the Bill, making it clear that if Parliament were to take it up, it would most likely result in robust and well supported legislation," she said. The activist appreciated the freedom she enjoyed during her tenure in NAC. "I would also like to record my deep appreciation of the democratic freedom I enjoyed as a member of the NAC. I can say with absolute certainty, that I have expressed my views fully and openly. It has never been even mildly suggested by you as the chair, that I curtail my expression either within, or outside the NAC. This has given me the space to finish my term with the NAC, with the confidence that I contributed my best to its functioning; without intellectual compromise, or negatively affecting my role outside." Roy said she looked forward to a continued association with all members of the NAC, and petitioning the NAC from the outside.